I haven’t told you this one, but my vet let something spill the other day when we were talking. She told me about how she’d lost it after putting down some kid’s bunny. The child had gotten it as a birthday present and treated it the same way. You know: cared for it with her parents’ help and when she could remember it, forgot about it most other times. So one day, she put the bunny on the sofa, forgot about it, and then sat on the poor thing. It screamed. You remember how rabbits scream, right? Like the ones we had as kids, high-pitched and terrified as anything? Okay, so the kid was a mess. The parents were a mess. The bunny was in the worst shape, though, and the vet told the parents as much when the family finally hightailed it over to see her. So the vet pumped the fur and the bones and the muscles you could see all full of blue juice, sent it to Heaven, and the parents swore they’d never tell their daughter it was all her fault. And I know what you’re thinking. I do, too, anytime someone brings up rabbits as pets. “Fluffy & Madonna.” Do you remember which one of us was dumb enough to name a bunny after a pop star? You know what, I’ll take the blame on that one. See, “Fluffy?” I get it. It’s a bunny rabbit. It’s got a billowy tail. But “Madonna?” And what did Mom & Dad tell us when we finally got done with them? That’s right: that they were going to go live with one of Dad’s coworkers. Did you ever believe them? I don’t know if I did at the time. I don’t know if Dad just set them loose in the wild, after driving a few miles outside of town, or if the bunnies actually did go to the woman who sat across from him at work. I just know that they didn’t deserve what we did to them. I remember that thin cage of theirs, out in the rain, yards away from the house. I remember watching them huddle together for warmth, but I don’t remember ever setting them under the porch. Listen, I know I sound morbid when I say this, but have you ever eaten a rabbit? Do you remember that Italian restaurant right off Times Square? The vet didn’t tell me what the state of that bunny was, but I wonder if it looked anything like the coniglio at the restaurant that afternoon. It was my first coniglio—my first cooked rabbit at all, if I remember—and I thought it tasted just fine, actually. The meat was dark and moist. Lots of good balance with the garlic and rosemary. Good wine, too. But here’s the thing: I don’t know if I remember that meal because it was an exceptional entree or because it was the first haunch of rabbit I’d ever eaten, or if it was just because it was the first meal we’d had as a family in years, just the four of us, each of us with a bite in our teeth. 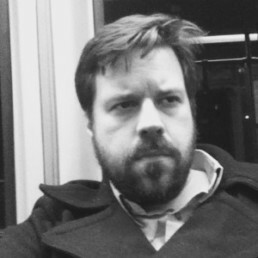 Barrett Bowlin teaches Creative Writing at Binghamton University, where he moonlights as a contributing editor for Memorious. Recent prose of his can be found in places like The Rumpus, The Adirondack Review, Camera Obscura, Meridian, The Minnesota Review, PANK, and Salt Hill, among others. An essay of his, “Ukemi,” was a finalist for Arts & Letters’ Susan Atefat Prize in Creative Nonfiction.